Nothing Will Ever Be Better!!!!!!!!!!!!!!!!!!!!!!! Seriously, the Best Ever!!! I saw Katie Rose Clarke as Galinda/Glinda, she was one of the best! Almost as good as Kristin Chenoweth, she was that good! I saw Jessica Vosk as Elphaba. She had a voice with no flaw!! If you saw her, you would clap until your hands hurt! Almost like Idina Menzel!! And as the Wizard, I saw Kevin Chamberlin. I knew Kevin from the TV show, Jessie. Who knew he could sing so well? A 5 star and must see show if you ask me!!!! My friend took me to see this musical, I had no idea what we were going to see, it was a wonderful surprise. Loved it & Elphaba has a beautiful voice. The cast was great, this is a must see if you want to see a Broadway show don't miss "Wicket." Having first seen a show on Broadway over 40 years ago, and seen touring Broadway casts in the meantime, Wicked is my all time favorite. Having seen the show six times (both tours and San Francisco) before finally making it to Broadway I can say the show here just seems more powerful, the cast more enticing, and acoustics more amazing. If you can only see one show in New York, you have to be a little Wicked. Wonderful Witch of the West! The characters were amazing, they indulged you in their well told story about the wicked witch of the west. A definite must see. The characters were amazing in the indulged you in this well told story. Go see if you can it's worth the money. I have seen Wicked twice, once on Broadway and once in Charlotte, both shows leaving me speechless. 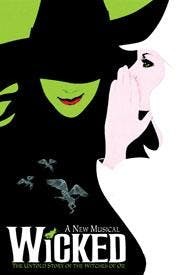 I am obsessed with Wicked and it is by far one of the best musicals ever. I would (and do) recommend seeing Wicked to anyone and everyone.